Upgrading to the Heritage Package takes your American Eagle to the next level of luxury. This premium upgrade gives you new graphic choices, complete with Heritage Edition emblem, 12” stainless steel trim and painted awning boxes, while presenting you with a virtual window in the bedroom and two choices of ThermoCraft laminated foil cabinetry inside. This package truly gives you the freedom to inspire. 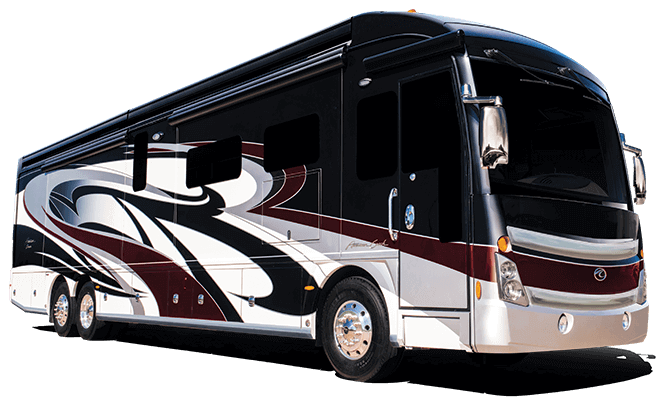 A top-of-the-line motor coach deserves top-of-the-line kitchen amenities, and the American Eagle sets the bar in luxury. The sink alone is a statement of modern design, featuring an apron-front, stainless-steel bowl with solid-surface covers. Cleanup is a breeze thanks to a chrome high-rise faucet with sprayer and a dishwasher drawer with wood-door front. Hidden task lighting and pop-up power outlets combine for iconic functionality. Every American Eagle is one-of-a-kind. In fact, every tile is laid by hand, starting with polished porcelain tile, featuring an extravagant room border, as well as glass and stone inlays. Glass tile backsplash adds a decorative touch in the galley. The tile floor itself is heated, and for even more comfort, American Eagle boasts the Aqua-Hot 600D with TribidHot three-source heating comfort for continuous, tankless hot water. 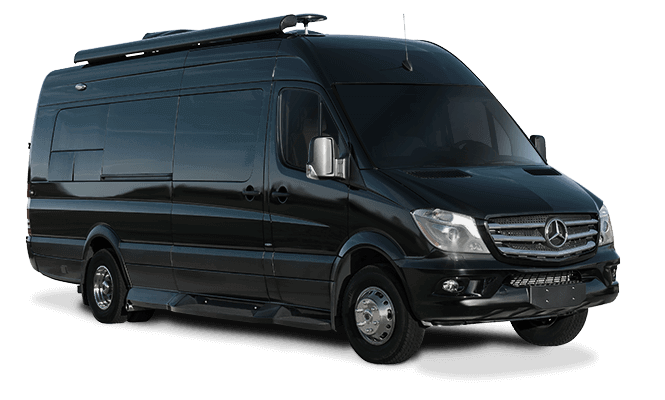 The American Eagle maximizes space thanks to innovative forethought. Hidden armrest compartments let you stow away remotes to the coach’s standard Sony electronics, including LED HDTV, Blu-ray DVD and home theater system with Bose Acoustimass speakers. More hidden luxuries wait — a flush-top pullout extension in the galley, pop-up electrical ports in select countertops and a file drawer in the deep-base dinette. 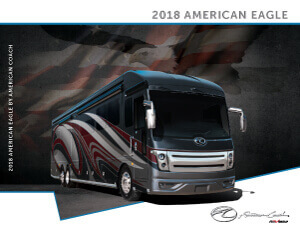 For the tech savvy connoisseur, the American Eagle features pop-up 110V and USB outlets in the dinette countertop, as well as multiple USB ports in the cab area and the master suite. And with the standard Crestron app, you can control the coach’s lights, blinds and audio/visual, while the cab dash features iPad integration with power and storage located behind the iPad. The iPad will even repeat the Xite monitor functions. The American Eagle is as refreshing as it is iconic. The master suite features a residential walk-in shower with full-glass door, dual towel rods, fold-down seat, rain shower head and stunning teak flooring (n/a 45N). 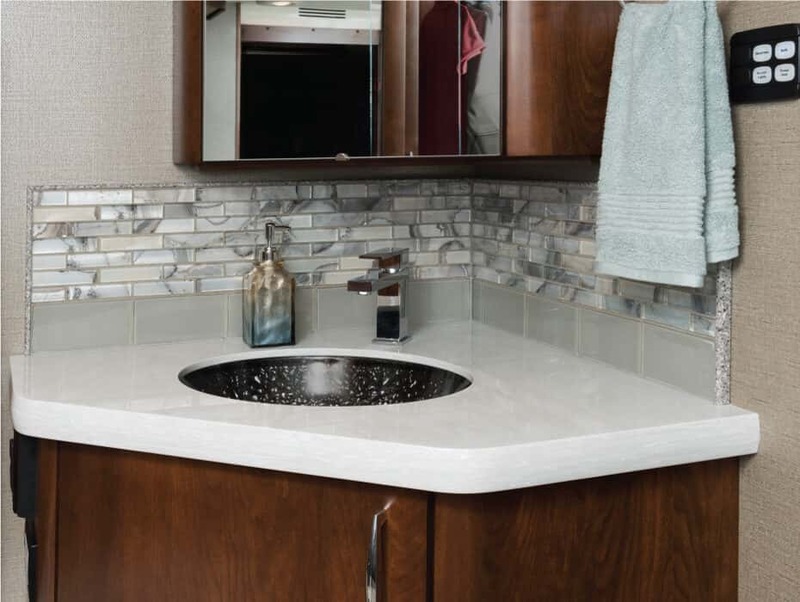 Modern, chrome Angular fixtures, an under-mounted glass bowl sink and a Tecma Silence Plus porcelain toilet with two-button vacuum flush complete both the master and half bathroom features. Curl up with a book near the warm glow of an electric fireplace (n/a 45A, 45T). For an even cozier read, upgrade to the optional Villa Ultraleather expanding L-shaped sofa with air mattress in the 45C, 45N and 45T models. For the right amount of ambiance, adjust the power privacy blinds with the Creston app, which controls the coach’s lights, blinds and audio/visual amenities. Even the American Eagle cab features powered cockpit privacy with light-blocking blinds. The most popular heavy-duty engine, the Cummins ISX15 delivers American Eagle’s best-in-class 600HP grit, along with 1,950 lb.-ft. of peak torque. The Eagle packages all of this with three-stage engine brakes and an Allison 4000 MH 6-speed transmission. Everyone deserves to own an icon. (We know we did when we designed the 2018 American Eagle. Now, it’s your turn to build your own legend.) Use our Build and Price feature to handpick your own interior décor, paint package and optional features. Start dreaming now! 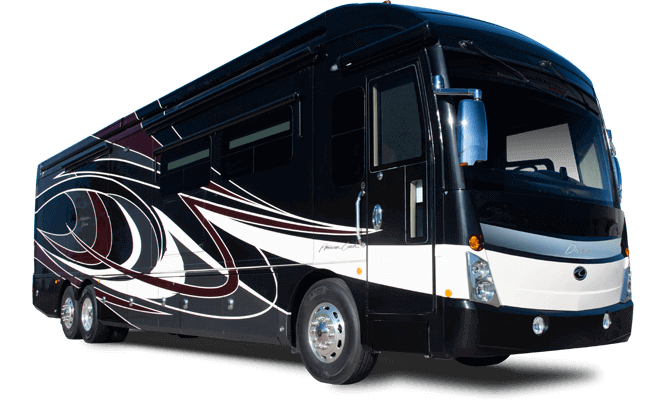 American Eagle is backed by American Coach’s RV OWNERCARE warranty program, a limited one-year/15,000-mile coach warranty and three-year/45,000-mile structural warranty, whichever occurs first. And with each warranty comes a network of trustworthy dealers and regional technical centers ready to get you back on the road.